Before we begin, a quick confession: I am not a psychic. Despite what you may have heard, I can't actually predict the future. In fact, I don't even believe in the time-tested tradition of making tech predictions (well, except for one foolproof prophecy I foist upon the Twitterverse every January, but that's a special sort of forecast). You know what I do believe in, though? Trends. Observing the sometimes-subtle trends within a tech ecosystem over time helps us understand the bigger picture of where things are moving and why. That's the kind of "future-gazing" that lets us make educated guesses about a then-tiny-young-platform's likelihood of exploding and, against all popular odds, becoming the world's most widely used OS. That's the kind of "crystal-ball reading" that lets us see the seeds of two separate Google platforms starting to come together and not canceling each other out (as popular opinion consistently predicted). And it's that same type of process that lets us make meaningful statements about what's likely to happen in the realm of Android over this coming year — not in super-specific, "Company X will release three phones in May!" sorts of terms, but in broad strokes that speak to the overall movements across the ecosystem. At the end of 2017, I published an "Android 2018 primer" — a look back at some of the insightful analysis from the past year as we prepared for a (theoretically) fresh beginning. I selected the stories in that lineup for a very deliberate reason — namely the fact that they got at those deeper trend-oriented narratives that are so frequently overlooked and lost amidst the more sensational and surface-level headlines. And, you guessed it: also because those same narratives can go a long way in informing us about the likely twists and turns in the road ahead. It's the biggest Android story most of the tech world missed (and continues to overlook in significance today): the slow-cooker-style coming-together of Android and Chrome OS, two different but complementary platforms with their own distinct but complementary purposes. It's a trend that's been underway for nearly three years now, albeit almost unnoticed for much of that time — and it's a trend that's practically certain to continue picking up pace in the months ahead. It helps to think of 2017 as the official "coming out party" for Chrome OS and Android as a symbiotic couple. In the past year, Google seriously cranked up the gas on the two platforms' alignment, with the launch of a new Android-reminiscent launcher and navigation system for Chromebooks, the debut of Google Assistant on Chrome OS, and, of course, the formal introduction of Android apps on Chromebooks — perhaps the most transformational move of all in a big-picture view. As I mused last fall, all of those moves helped set the stage for Chromebooks to effectively become the new Android tablets — Google's next-gen focus for the large-screen computing experience. The next steps of convergence between Android and Chrome OS will only help to solidify that reality as more and more hardware-makers get on board with the concept. To wit: Numerous signs suggest Google is preparing for Chrome OS to support fingerprint sensors (something that seemed to be in the initial plans for the company's inaugural Pixelbook, even if it didn't end up making the cut). Code changes indicate developers are also working on a system-wide voice-to-text function for Chromebooks — another Android-like touch that'll bring the Chrome OS and Android experiences closer together while simultaneously filling in the gaps of a Chromebook as a touch-oriented device. Beyond that, Chromebooks are soon expected to get Android-like support for inline notification replies, an Android-like system for more secure OS-level VPN connections, better multitasking capability for Android apps running in the background, a native system for reading and replying to Android-based text messages, and even more Android-like Material Design elements (part of an ongoing design shift that's been happening bit by bit, mostly unrecognized by the masses, for months on end). This ain't a fluke, folks: As I've said countless times throughout this process, each individual piece of the puzzle may not look like anything monumental in and of itself — but add 'em all together, and you start to see the forest for the trees. Keep a close eye on that woodland in 2018, and you're bound to see some interesting things. 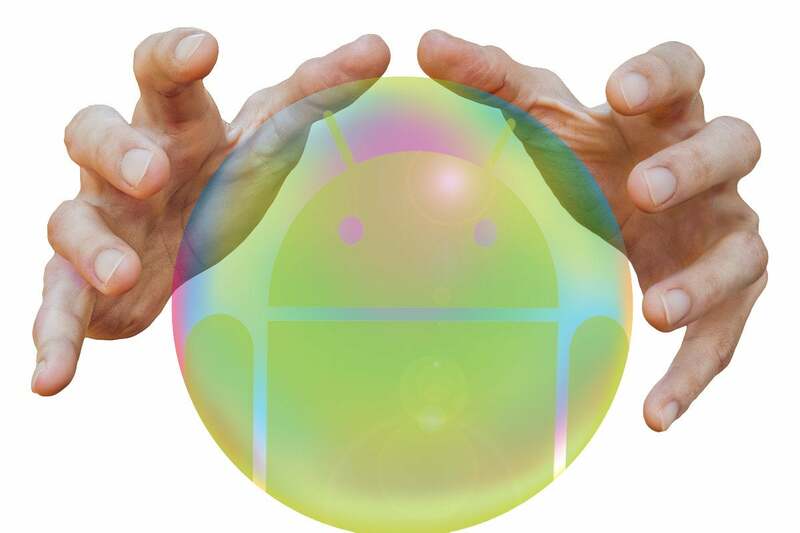 Android security is always a hot topic — and despite the fact that most of the buzz tends to be sensational hype with next to no real-world impact, the fear-inducing headlines really do create a perception of Android being a virtual Wild West where danger is constantly lurking. Misguided as that notion may be, the very existence of such a perception is a problem Google has long sought to solve. And the company's moves over the past 12 months make it quite clear that security will continue to be a meaningful focus for Android in the months ahead, especially as it relates to Android's enterprise adoption. Some noteworthy nuggets about what's in the works: In late December, Google announced a new plan to verify app authenticity within the Google Play Store. Google also launched a fresh effort to warn users about mobile apps and websites that might collect personal data without consent (a far more pressing concern than malware for businesses and individuals alike). In addition, 2017's Android 8.0 Oreo release included a number of not-so-obvious security enhancements, many of which were designed to lay the groundwork for future technologies. In researching those enhancements, I also learned that Google is working on "a lot more" with encryption, particularly as it pertains to the enterprise, for 2018's Android P release. If all of that isn't enough, in recent weeks, Google's been pumping up its managed version of Google Play for enterprises — a system that allows companies to "safely and quickly distribute private enterprise apps," as the company put it in a late-November promotion — and at the same time highlighting how its own Pixel hardware features a new type of tamper-resistant security module created "for enterprise-grade security." The underlying theme to Google's massive 2017 hardware push wasn't just that Google was making its own devices. Beneath the surface, the real message was much deeper: that Google itself — not Android, not Chrome OS — was becoming the unifying thread for the company's mobile tech vision. Google, in other words, is now the primary ecosystem. With HTC's hardware-making talent now on the home front, Google is poised to turn this shift up a notch. Its focus on software as a differentiator gives it a unique advantage among Android device-makers, and if it can figure out the tricky pickle of marketing and distribution, it could — in theory — reshape the Android ecosystem as we know it. That's a big fat "if," as we all know. But what seems certain is that Google is going to keep pushing forward and trying. A more diverse and aggressively promoted device lineup seems all but inevitable, as does an expanded emphasis on the benefits of using multiple Google devices for a cohesive and connected experience that continues to improve over time — something no one else in the Android world can truly offer. Google plainly wants to be a hardware giant — and in the mobile tech realm in particular, owning your own fully controlled retail experience is an enormous advantage when it comes to developing positive customer relationships. And yes, we can pretty much sum that up by saying "just like Apple" here, because Apple most certainly has gotten the retail and in-store support side of its operation exactly right. At this point, it appears to be less a question of "if" and more a question of "when." And with new reports that Google could be working to open physical retail stores in India within the year, it doesn't seem like a stretch to say the Google ecosystem effort we see today is but a short introductory chapter in a story that'll take years to unfold. While all this fascinating stuff is going on beneath the surface, most third-party Android manufacturers are giving every indication they'll continue to focus on superficial surface-level qualities to sell their devices. And yes, that means lots more likely attention to the always-exhilarating subject of bezels, bezels, and more bezels. Just like the obsessions over extreme thinness, maximum megapixels, and utmost display density in years past, the current fixation on bezels is more about moving product than providing anything of practical benefit. And it's no surprise: When a company doesn't control the software and has no interest in providing meaningful ongoing software-oriented enhancements over a product's lifespan, diverting attention to a device's superficial qualities is about the most sensible tactic it has for selling incrementally improved new phone models. This is all par for the course, and once the "low bezel" bulletpoint loses its oomph, phone-makers will move onto some other meaningless metric to make their wares look new and exciting. It's a consistent trend in the mobile tech world, and there's no reason to think it'll stop anytime soon. Those of us with perspective, though, can continue to look past the surface and evaluate a product for all of its qualities, tangible and otherwise — including the more significant differentiating factors that'll actually affect us on a day-to-day basis over the device's multiyear life. But hey, you're here and reading this. You already know all about that stuff. And now you know what else to watch for in this weird, wild world of Android as we venture into the uncharted terrain of 2018. So buckle up and hang on tight, my friends: This ride is leaving the station, and no matter how much context we may have about its general path, trends are anything but a blueprint — and you can bet we'll encounter plenty of unforeseen peaks, valleys, and detours along this next leg of our jolly ol' journey.